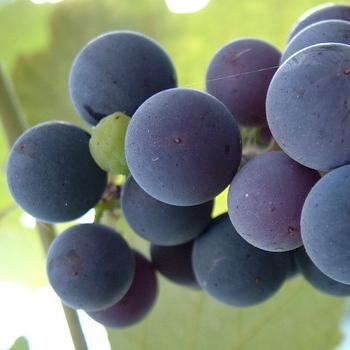 Grapes come in red, purple, rose, green and gold, large and small, round and elongated. Grape vines grace walls and arbors and their leaves lend drama and fall color to the landscape. Choose a grape variety for your climate and particular purpose. Late season, large purplish black grape. Use fresh or for raisins. Ripens in late September, early October. Hardy to USDA zone 7. Self-fruitful. Spur prune. PLEASE NOTE THAT GRAPES CANNOT BE SHIPPED TO OREGON, WASHINGTON, IDAHO, NEW YORK AND THE CALIFORNIA COUNTIES LISTED ABOVE. Late season seedless grape that ripens in early October. Medium sized, firm, very sweet with excellent quality. Cold hardy to zone 7. 100 hrs. Self-fruitful. Cane prune. PLEASE NOTE THAT GRAPES CANNOT BE SHIPPED TO OREGON, WASHINGTON, IDAHO, NEW YORK AND THE CALIFORNIA COUNTIES LISTED ABOVE. Medium sized grape, light red with crisp, sweet, excellent flavor. For fresh use or raisins. Needs hot summer. Ripens early, before Thompson. Vigorous. Hardy in zones 7-10. 100 hrs. Self-fruitful. Cane prune. PLEASE NOTE THAT GRAPES CANNOT BE SHIPPED TO OREGON, WASHINGTON, IDAHO, NEW YORK AND THE CALIFORNIA COUNTIES LISTED ABOVE. Large mid season white seedless grape. Flavor is sweet with slight Muscat flavor when very ripe and exposed to light. Fruit holds well on the vine and in storage. Best for fresh eating and raisins. Cane prune. Hardy to zone 7. Ripens mid to late August. PLEASE NOTE THAT GRAPES CANNOT BE SHIPPED TO OREGON, WASHINGTON, IDAHO, NEW YORK AND THE CALIFORNIA COUNTIES LISTED ABOVE. Medium to large dark red, sweet, crisp grape; excellent fresh or for raisins. Ripens after Thompson. Has large clusters, is vigorous and productive. Requires less summer heat than Thompson or Flame. Cold hardy to zone 7. 100 hrs. Self-fruitful. Cane or spur prune. PLEASE NOTE THAT GRAPES CANNOT BE SHIPPED TO OREGON, WASHINGTON, IDAHO, NEW YORK AND THE CALIFORNIA COUNTIES LISTED ABOVE. Most popular grape in California and Arizona. Use fresh and for raisins. Pale green, very sweet, high quality. Thin the clusters for larger berries. Needs plenty of heat to ripen. Ripens early mid season. Vigorous. Best in zones 7-9. 100 hrs. Self-fruitful. Cane prune. PLEASE NOTE THAT GRAPES CANNOT BE SHIPPED TO OREGON, WASHINGTON, IDAHO, NEW YORK AND THE CALIFORNIA COUNTIES LISTED ABOVE.